I’m really enjoying being a part of the internet community of crocheters. It’s motivated me to do a lot of things I wouldn’t have otherwise. Like this thread bookmark. I’ve been thinking about thread for a while, and several weeks ago I made my first attempt with a few flowers and leaves, but it was the Crochetville Swap (July-August is bookmarks) that finally prompted me to do an actual project. 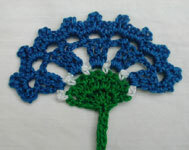 This is my first thread bookmark, Angela’s Cornflower Bookmark. I’ve started on another as well, Cro-Tat Beaded Bookmark. I’m having fun working with thread. It’s so dainty and pretty, and bookmarks make for a quick, satisfying project. Donna, wonderful job on that bookmark. It inspired me to give it a try. I posted about it in my blog just this morning with a few new pics. I LOVE the colors you used for that it really POPS! I love it! It’s really beautiful. Oh, how cool! Thanks for the link to the pattern. Adding this to my crochet folder. oooooh very cute. :) I went and bought a book for bookmarks today. I will try to make one too. That is so cute. You did a great job on it and it looks so dainty. Anyone have a copy of the Friendship Ring Bookmark. I have seen a lot of the finished product and know it was in the June issue of Hooked on Crochet, but have been unable to locate a pattern.